Total + 95 votes for Obenshain, + 234 votes Herring. Net Herring increase of 139. 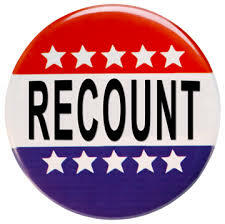 The recount is expected to last through Wednesday, with the court hearing ballot challenges Wednesday and Thursday. We should have a winner declared Friday. Such a challenge — under an obscure provision in state law, never before exercised in a statewide race, that allows appeals to the General Assembly — would be an act of contempt for Virginia’s voters.